The 10 Best Museums in Georgia! Museums offer an area for learning, ingenuity, creativity, and excitement. From science museums to historic house museums, the state of Georgia boasts a powerhouse of players in the museum industry. Here are a few of our favorites. The Tellus Science Museum in Cartersville is home to an impressive T-Rex, a replica of the Wright brothers’ first flyer, and its own planetarium and observatory. After panning for gemstones and digging up fossils, museum-goers can also tour special exhibits that run throughout the year, glimpse the stars at the Bentley Planetarium at Tellus, which features a state-of-the-art experience at viewing our solar system, and even take in an impressive view of the night’s sky via a telescope at the Tellus Observatory. Since it first hit the bookshelves and later the silver screen, “Gone with the Wind” has inspired generations to fluff up their petticoats and practice their most charming southern accents. Located in downtown Marietta, the Gone with the Wind Museum features an extensive memorabilia collection, including the original honeymoon gown Vivien Leigh wore in the film. Margaret Mitchell’s personal volumes, rare costume pieces, contracts, scripts, promotional artwork and collectibles are just a taste of the items the true “Gone with the Wind” fan will glimpse during their visit. “Gone with the Wind” fans can find even more to explore at the Atlanta History Center. For one ticket price, guests get free parking and access to the Center’s 33 acres of exhibits, gardens, interactive programming, and historic homes—including the Margaret Mitchell House. “Gone with the Wind” isn’t the only thing on the agenda though. The center also boasts several magnificent gardens, the 1930s-era Swan House, and a host of informative exhibits covering a wide variety of historic topics. The Atlanta History Center is also a renowned destination for researchers, especially as it pertains to the Civil War, Georgia genealogy, horticulture, and so much more. Macon, Georgia is the home of Little Richard, the Macon Cherry Blossom Festival, and the Tubman Museum. The Tubman is the largest museum in the southeast that tells the stories of the African American community. For more than 30 years, the museum has housed artwork and artifacts, telling the rich history of famed African Americans. A 55-foot-long mural is the museum’s centerpiece, depicting the feats of African Americans over the centuries. Ever been to an outdoor museum? There’s a first time for everything! Oakland Cemetery, Visitors Center & Museum Shop cannot be left off this list. There is more to this museum than just a cemetery, too. In the 19th century, as a prelude to the national park system, a “rural garden” movement thrived in the U.S. Garden cemeteries at that time were created as more than a place for the grieving to mourn their lost loved ones, but also as a destination for picnics and carriage rides. 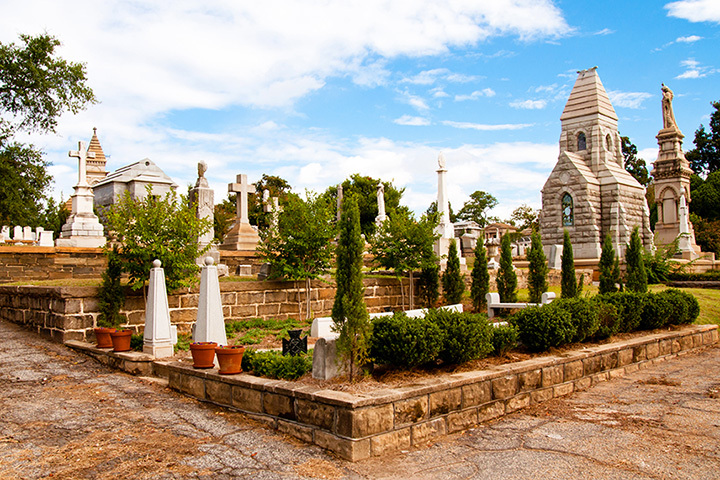 Atlanta’s Oakland Cemetery is more than just a park and botanical garden, as it is also home of impressive art and architecture, including 55 mausoleums, Smithsonian-listed sculptures, Tiffany stained glass windows, and the 1899 Gothic Revival Bell Tower. The Bell Tower is one of the oldest structures in Atlanta still standing in its original location. The 48-acre property includes a Visitors Center and Museum Shop, located in the historic Bell Tower, where visitors can drop in for a tour, flip through a selection of books on cemetery symbolism, peruse locally-crafted jewelry and gifts, and enjoy a selection of Atlanta and Civil War history merchandise. And since we seem to be on a Gone with the Wind theme here, Oakland just happens to be the final resting place of Margaret Mitchell, as well as several state governors, Atlanta mayors, and Civil War generals and soldiers. If you’d like to buy the world a Coke, the World of Coca-Cola Museum sounds like a pretty good place to start. The legendary, top-secret Coca-Cola formula is tucked safely away in the on-site vault (or so they say). Visitors can glimpse the super-secret vault (the outside, anyway), have their photo taken with the infamous Coca-Cola Polar Bear just in time for the holiday season, and learn all about the world-famous beverage. Grab some swanky souvenirs in the gift shop, check out the impressive and often one-of-a-kind artifact collection, taste more than 100 different beverages that Coca-Cola produces across the globe, and finally, take home a souvenir bottle of your very own. Kermit the Frog and Jim Henson cut the ribbon to open Atlanta’s Center for Puppetry Arts in 1978, so it’s not surprising that one of the museum’s most popular permanent exhibits is based on Henson and his work. The Global Collection, which highlights puppetry traditions from different cultures around the globe, includes puppetry art from Asia, Africa, Europe, and the U.S. The center also features special rotating exhibits each year. One of the best western art museums can be found down south in Cartersville, Georgia. The Booth Western Art Museum features an assortment of artwork that can be viewed at your leisure or as part of an hour-long guided tour of the permanent exhibit area that takes place daily at 1:30 p.m. The permanent collection features more than 100 works of art including paintings and sculptures. The collection is divided into four themed areas, each showcasing art specific to an artistic topic or historic time period. Families should enjoy the interactive play space of the Sagebrush Ranch area, which offers hands-on art and western-themed activities. The Bremen Museum has some pretty amazing and impactful exhibits, both permanent and visiting. “The Absence of Humanity: The Holocaust Years, 1933-1945” is the museum’s focal exhibit. Displaying Atlanta’s Jewish cultural, artistic and resonate history, The Bremen also includes a considerable library and archives, and is home to The Weinberg Center for Holocaust Education. One of the unique things about The Bremen is its online exhibit. If you can’t make it to Atlanta in person, just go online to visit from the comfort of your favorite chair. The oldest public art museum in the southeast, the Telfair Art Museum has played an integral role in Savannah’s geographic and social landscape since the 1880s. Originally located in a renovated family mansion, the museum has grown into three-building institution with a permanent collection to rival the competition. With more than 4,000 works of art on display from the U.S. and Europe, two 1820s-era homes on the National Historic Landmark registry, and the more contemporary Jepson Center, the museum offers first-rate exhibits and programming that should not be missed.